Orchard Dental Group proudly brings CAD/CAM dentistry (computer-aided design and computer-aided manufacturing) to the Twin Cities east-metro area. Our in-office CEREC® system allows us to provide single-visit restorations including crowns, veneers and overlays. 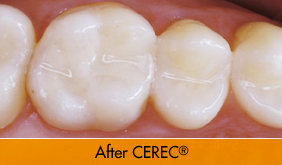 CEREC is transforming modern dentistry. Conventional crowns require multiple visits, messy and imprecise impressions, precarious temporaries, and a long wait for the permanent solution. In contrast, CEREC lets you walk out of the Orchard Dental office with a perfectly designed, matched and fitted crown restoration in just one visit. For patients like you, this means fewer injections, less drilling, and less time taken from your hectic schedule for dental care. A CEREC tooth restoration is more than convenient. It is also healthy—and better performing. The CEREC solution uses strong, tooth-colored ceramic materials that closely match the composition of natural tooth structure. When you eat hot and cold foods together, the restoration and the tooth expand and contract in nearly equal rates. This prevents discomfort and potential cracking. In addition, the restoration process allows us to leave more of the healthy tooth structure in place, resulting in a less traumatic procedure and a stronger long-term solution. 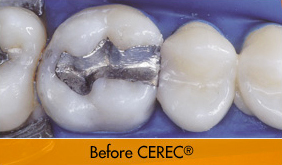 Want to learn more about CEREC single-visit restorations? Call the Orchard Dental office. We’ll be glad to help you determine if this is the right solution for you.